For all parents that want to experience a really fun couple of days in a city, and for free, Wrocław is the place to go. We’ve all wanted our children, our students, our friends’ kids to enjoy the places we’ve brought them to; and, well, they sometimes just don’t. It’s exasperating and frustrating. 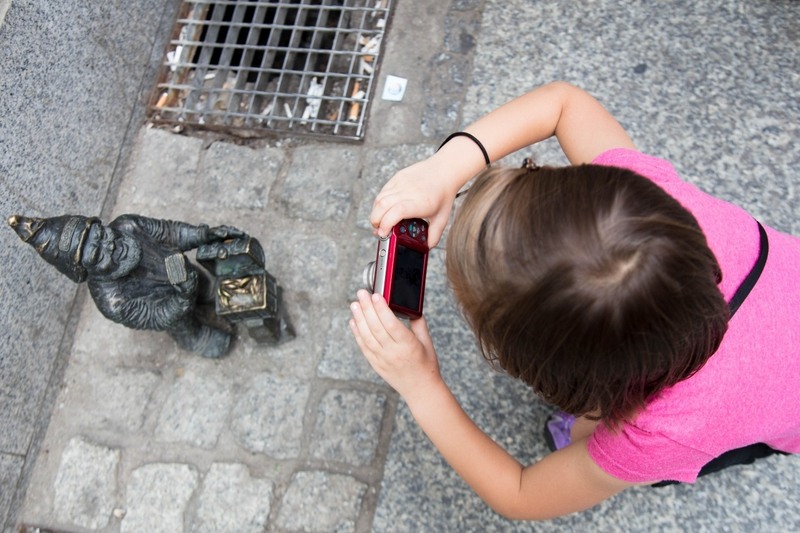 Why can’t cities, museums, places of historical interest keep children in mind at all times? Well folks, Wrocław has done it! I hope they become an example for all city tourist boards! Wroclaw with kids; it’s where you want to go! What is more magical than a whole orchestra of dwarfs? 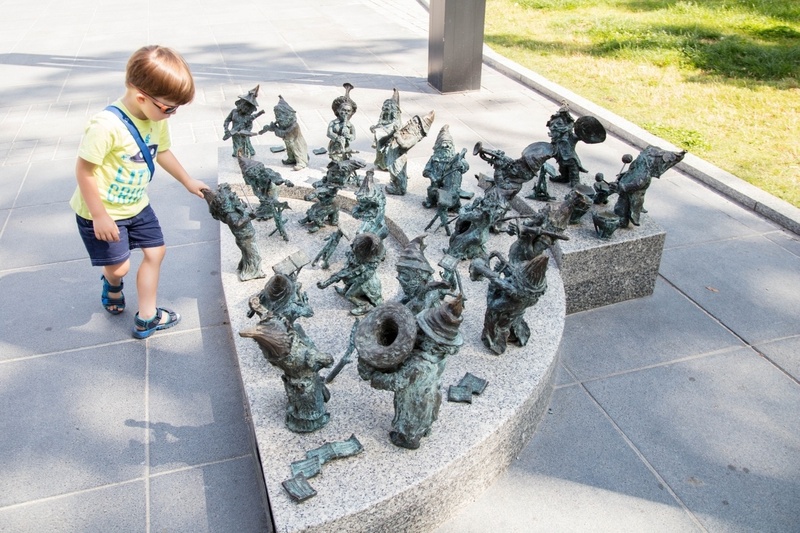 Little M was fascinated by the many mini-statues he found all around the city. This is why Wroclaw with kids makes the city that much more fun! 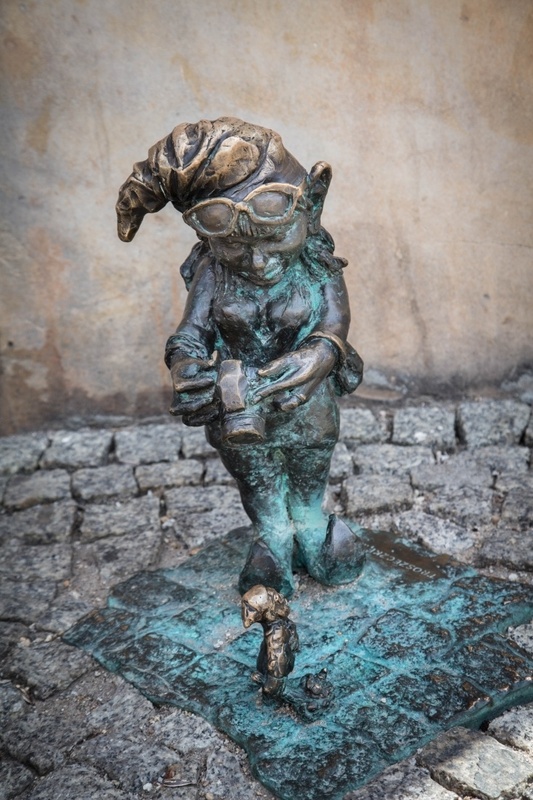 Why Do Dwarfs Inhabit Wroclaw City Center? Have you been to Wrocław with kids? How many dwarfs did you catch? This is a position we can all relate to nowadays. 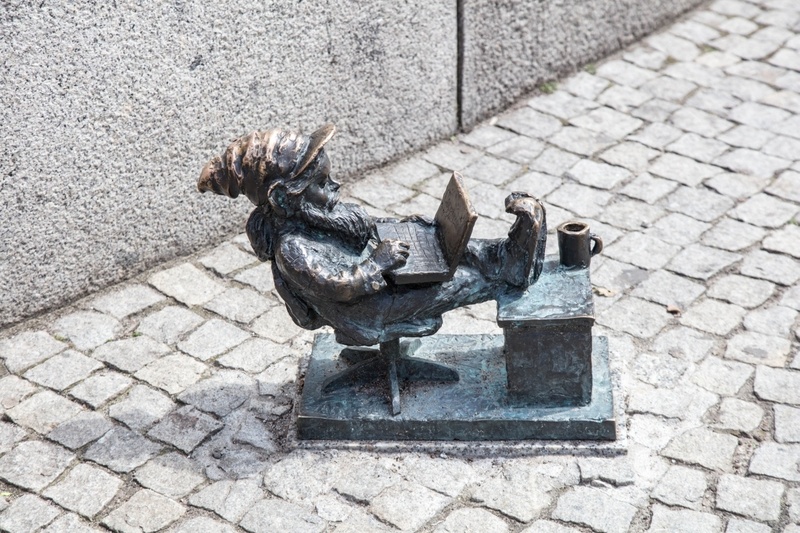 Even Wroclaw dwarfs like their wifi! The money lender looks generous enough. Wrocław has “doing it” down in spades, and has become the City of the Dwarfs. 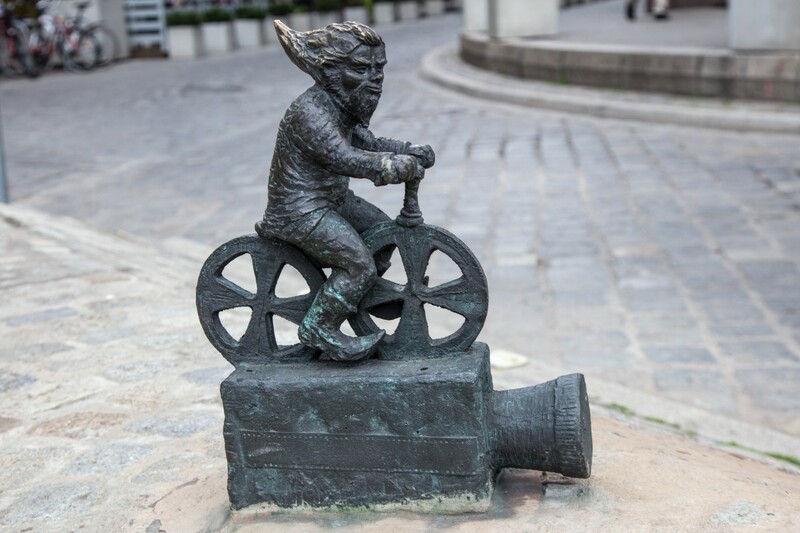 There are foot-high statues all over the city of one, or more, dwarfs representing a job or an activity, and often, but not always, related to the location. For example, the money machine dwarfs just happen to have their machine located next to three cash machines at one of the banks. Just walking along the streets becomes a treasure hunt for any kid, young or old. 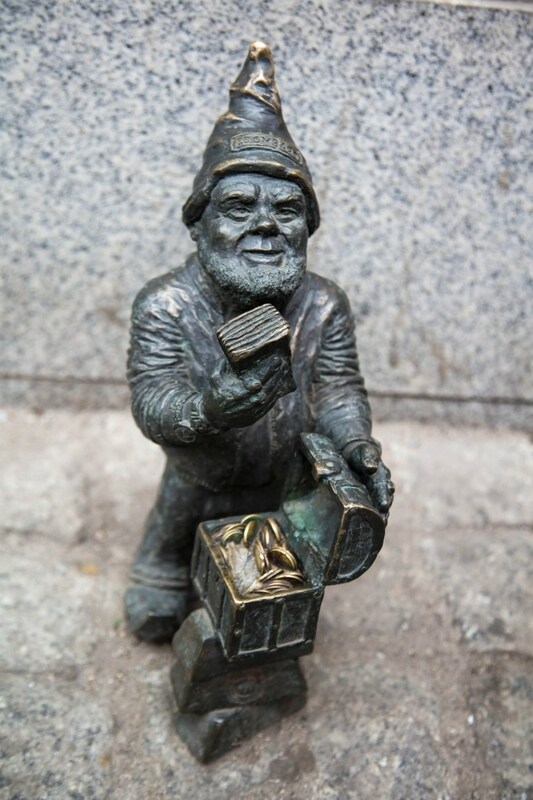 According to the Wrocław City website, the dwarf statues first started appearing in 2005 and have grown to a number of around 300. Probably my favorite dwarf in all of Wroclaw, this tourist dwarf is taking photos of all the dwarfs she finds. Why dwarfs? Well, I don’t think the city initially thought of all the kids in the world looking for them, and instead, it began as political statement and a tribute to the Orange Alternative and its founder Waldemar Fydrych. This anti-communist group was active in the late 1980s and would try to undermine the current regime in whimsical and silly ways so that the militia would look foolish when they tried to suppress them. 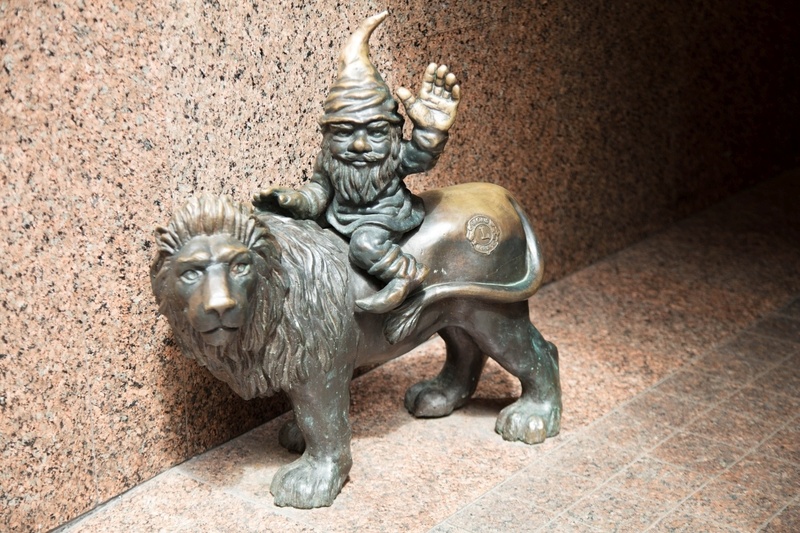 And another Wroclaw dwarf after my own heart…chasing down the ATMs so I can spend more money on those Polish souvenirs! One way it would do so was through graffiti. It is a tradition that Wrocław still embraces today. You can see graffiti on almost every wall and door. It can be extremely unsightly; and, during the communist regimes, the militia could easily find the graffiti culprits. The Wroclaw dwards, only about 10 – 12 inches high, are at the perfect height for small kids, and they love it! Many were arrested and imprisoned,the anti-communist slogans painted over, and everything would go back to normal, for a while. The OA started painting small dwarfs over the painted-over graffiti. These were more difficult to locate, and they were seemingly less threatening. Regardless, Fydrych was still arrested and given a life-long sentence. 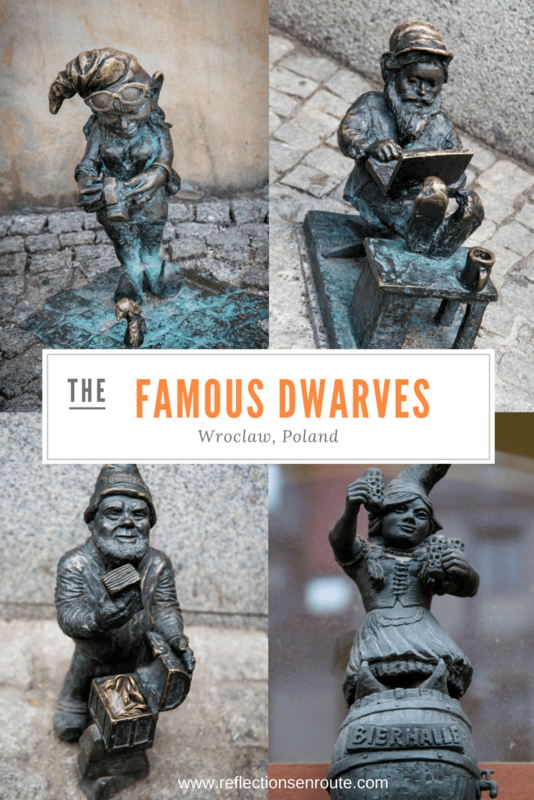 Wroclaw dwarves come from all walks of life, and this one…a movie-lover, is one we can all relate to. At any rate, graffiti or no, Wrocław is a joy to walk around. Not only does it have a gorgeous city hall, as well as many other beautiful buildings, it has these fantastical and fun little dwarfs to search out. I challenge all of you kids, from 2 to 102, to go out there and find some of these dwarfs. One of the very first dwarfs I found the first time I visited Wroclaw! If you would like to find out more about the dwarfs, they do thave their own website, and you can also pick up a map of all the dwarfs’ locations at the Tourist Information. It is located right in the middle of the town square (Rynek). 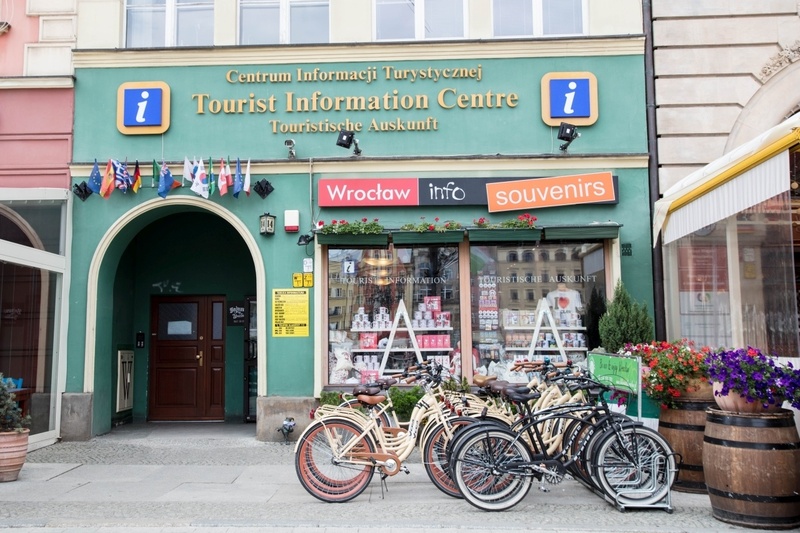 Grab a map at the Wroclaw information center in the main square and go on a dwarf hunt. After searching for Dwarfs, why not do some Polish Pottery shopping at Poland’s Pottery Capital, Boleslawiec. We love staying in Wroclaw at the LeoApart apartments. They are modern, clean and affordable and right in the old town with secure parking. We don’t have any type of special partnership with them or anything, but having the extra rooms and kitchen makes for a very comfortable stay, especially with children. Pin Wroclaw, the best city for Kids for later! Yes, Jim and I really loved the city, and now we have to go back just to find some girl dwarves! I found this old post from a pin on Mappin Monday and it’s such great timing as (I think I said to you before) we’re debating a road trip to Poland this summer…I’ve heard how lovely this city is and now it seems even more charming. Thanks Corinne! Phoebe, I loved Wroclaw…such a great little city. Do you like Starbucks? Theirs has the best view! Hey! Great to see this article. We go to Wroclaw next week with our kids and can’t wait to do some dwarf hunting! They have been very excited about it ever since I told them. Sharon, Have fun! They are really cute and individual. You will love it! I’ve heard so many good things about Wroclaw but I hadn’t heard about the dwarves. What a great little treasure hunt! Jollies, This, for me, makes Wroclaw super special. I encourage everyone to go! Ruth, It’s true. I think Poland is underrated as well, and within Poland I think Wroclaw is one of their finest cities. Eric, I do think it’s very similar to geo-caching. I just know that kids of all ages love looking for the dwarves. They are so relate-able. Oh I love these little dwarves around the city, I will definitely get a map so we can track some down and photograph them. And I love pottery so that’s a great tip too. Kavey, I hope you enjoy your time in Poland. It’s a lovely country to explore. I had never heard of this city prior to this article, although I have had Poland on my mind for a while. Definitely need to do a little more investigation, as it looks like a fun place to visit! Thank you! 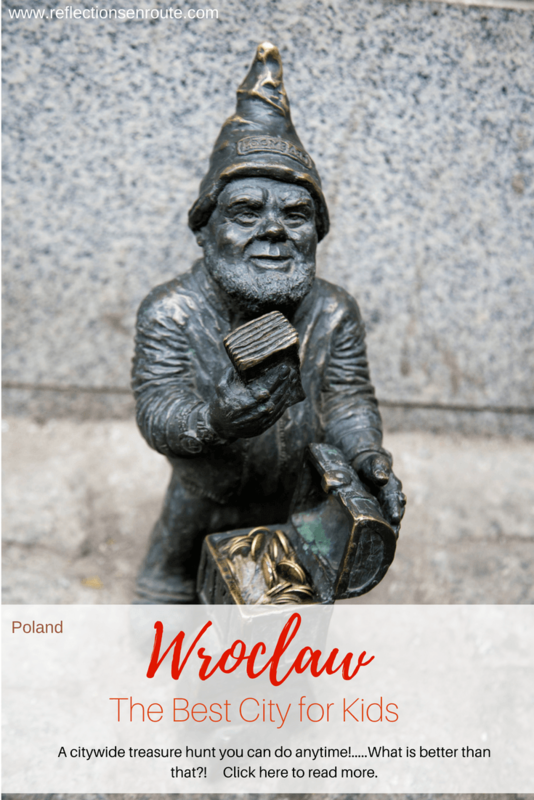 If you are building a Poland itinerary, I definitely would make sure to put Wroclaw on it. I love that city. I have heard of the hidden stones before, since my daughter lives in Tacoma. Yes, I think it adds a little excitement to discovering a new city. Oh my goodness this is SO something I would do! 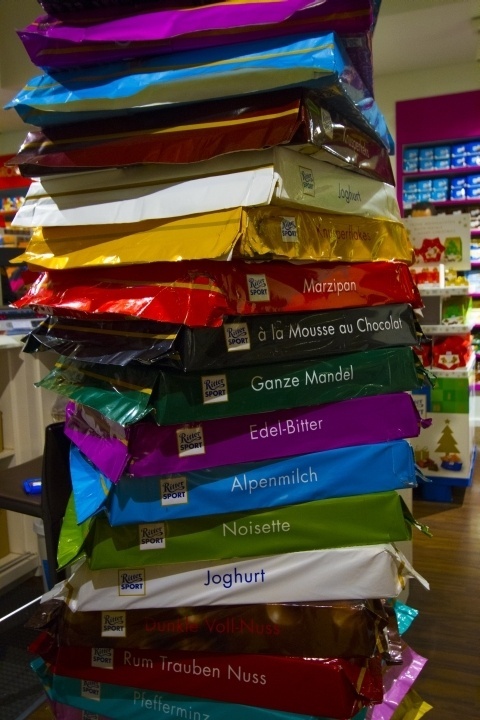 I’ve heard great things about Wroclaw, but this made me want to visit even more! Brianna, It’s a beautiful city…and it has dwarves! You’ve got to go! Those statues are brilliant! How have I never heard about them before?! Laura, I don’t know, but you have got to go on a dwarf hunt. I have been twice, and both were just as fun! How cute are the dwarves. I can see how kids would be enchanted by them and the city generally. We haven’t been to Poland yet but can’t wait to go and take our little one. Looks like she will just love it. Thanks for sharing. Skye, I’m sure she will. For a week afterwards, Little M kept asking if we could look for dwarves, and we had left Wroclaw. So much fun. This looks like such a fun city to explore, love these dwarves all over too! We’ve not visited Wroclaw but we’ve heard good things and visited Poland twice and loved it, so I am sure we would really enjoy it! Nic, You two would love it. It’s a gorgeous, fun city to begin with then just searching for dwarves puts it over the top. I LOVE THE DWARVES! That is so awesome! I could be very entertained hunting for dwarves. Nina, We certainly were. The first time we didn’t take kids and we had just as much fun as they did! Carmen, Didn’t you just love Wroclaw?